For many folks greeting Iowa for the first time along Highway20, Sioux City provides their first glimpse of the Hawkeye State. And that’s not necessarily a good thing. The city’s local (read: non-canned) country station goes by the call numbers KSUX, for goodness sake. By night, the city burns with the otherworldly glow of “Riverboat” gambling while old roadside motels slowly decay. 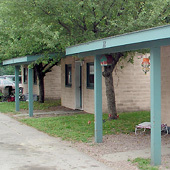 By morning you might drop by the Corey Motel with its little stone block cabins, each shaded by an individual tree. Nearby a massive grain complex fills a line of trains just passing through. Before long, the chug of morning traffic releases you into the countryside and you can peer further onto the horizon for a nicer a quieter and nicer abode less than 15 miles east of town. Slow down when you reach the Motel 20 in Moville. 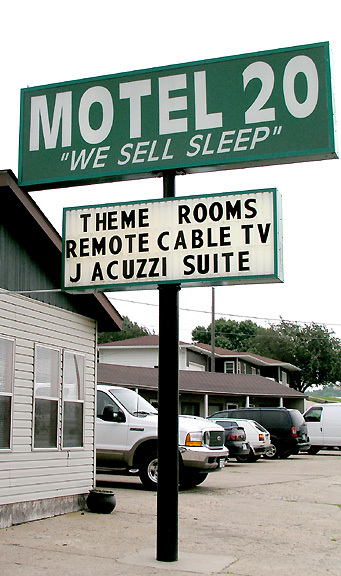 Located along frontage road, the motel offers a humble attempt at “theme rooms” including one dedicated to the Fifties, a Jacuzzi room, and one oriented around a cola-flavored soft drink that out not be mentioned here. Trademark lawyers get enough business without our help. 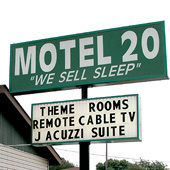 The Motel 20 aligns itself with a cafe small and local enough not to need a name.